Vincent Price returns to a series of films he is famous for being in, but if you actually watch them both (he didn’t appear in the third movie, Curse of the Fly) you’ll notice that he doesn’t do much but faint, talk with a lisp and make pained faces at the fates of his various relatives. You might remember that the Fly had a son named Philippe in The Fly. Well, Philippe is all grown up now and appears to be in his early twenties. He’s a scientist and of course has in interest in joining the family business of turning into a fly-headed monster. Even scarier is that he’s played by Bret Halsey who went on to star in Lucio Fulci movies such as Touch of Death and Demonia! On the way home from the funeral, Phil bugs his uncle François (Price) into spilling the beans about what really happened to his dad. Immediately upon hearing the sordid details, Phil knows there is only one nonsensical course of action to take! He has to finish the teleportation invention that mutated his dad! François refuses to fund the research so Phil takes François’ best scientist, Allan, and leaves to start his own lab. Luckily he has a mansion outside of town that his grandfather left him. His grandfather also left him a housekeeper and a pretty young thing named Cecile. It’s really everything the aspiring man-fly needs! Eventually Phil requires money so he goes to François and threatens to sell his half of the family company unless François plays sugar daddy. This is also Price’s way of getting some face time on screen, because François is going to hang out at the lab and make sure that Phil doesn’t get turned into a fly or something. You can imagine he was just at good at doing that as he was in negotiating with Phil over the whole funding issue. Now it’s time for the wacky experiments. First they opt for some nostalgia and transport an ashtray just like his loser dad did in the original. That worked out okay so it’s time to do go to the lab cages full of frightened little animals. Guinea pig time! They teleport this little rascal and he comes out on the other side gigantic! Cool! Giant guinea pigs rampaging allover the lab! I thought we had a The Food of the Gods situation on our hands! But Phil merely looks at it and says something like “giganticism, we need to adjust the amplitude.” Thanks, Dr. Boring! The best transformation involves Allan though. Allan the scientist turns out to be really Ronnie the British fugitive! Ronnie’s big idea is to steal the plans for the teleporter and make a mint selling them to the “electronics cartel” whatever the hell that is. Ronnie’s plans run into a slight setback when his brawl with a cop results in a teleporter incident involving the cop and another guinea pig! The cop ends up with the hands and feet of the guinea pig while the guinea pig has human hands! And then Ronnie stomps the guinea pig! Yuckiest assault on a law enforcement officer ever! Phil confronts Ronnie and simply holds up the cop’s handcuffs and then in the coolest move of the movie, he takes them and smacks Ronnie in the head with them. Another brawl in the lab goes down and Ronnie again dumps his opponent in the teleporter, this time with a fly! François shows up and brings Philippe back only to find out that he has the head of a fly and the arm and leg of one as well. The Fly goes on a rampage and escapes into the night in search of revenge, the police shooting at him the whole way. In the first movie the fly head looked pretty good. Fairly realistic (as much as a giant fly head could be) and somewhat understated in its monstrousness. The 1959 model featured in this film is hilarious looking though. The head is just way too big. You can almost see the actor tipping over because of its weight and size. It reminded me of those big-headed puppets at Mardi Gras. Watching him try to run through the countryside and dragging his fly-foot was certainly creepy, but mostly pathetic. 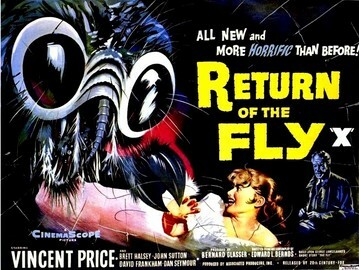 Return of the Fly paled in comparison to the original in other areas as well. It’s short, leaving things feeling rushed. This doesn’t allow any involvement with the characters. Screen time that should have been spent developing Philippe into something beyond the humorless young scientist he was instead went to characters like Ronnie and his crony. Certainly there was the potential to do something with the idea of a son carrying on a father’s work which ultimately killed him, but instead the film was only interested in jerry-rigging things to get another guy into a giant fly mask. The appeal of the first movie wasn’t some fly mutant running amok, it was watching a good man destroyed by his work, fighting to save his rapidly deteriorating humanity and to protect his wife from what he knew he would become. Watching somebody lose the battle for all the things that matter to him resonates with everyone on some level. Watching his son try not fall over because of an oversized prop fly head only makes you realize that they should have hung a flystrip up in the lab the second go around.